Looks interesting I must say. Anyone have pictures. I am interested if the font is - well let's say - sharp. Faisel, I find it interesting that this book has newly commissioned artwork and is signed by the artist. Is it possible that EP is attempting to be a new LEC? As you say, the quality of the printing itself remains the question. Although when it comes to illustrations for this particular tale, I prefer something more atmospheric--as in the black & white photos used in the Arion Press edition, these are quite good, in the same vein as some of the best recent Folio Society adventure tales--I'm thinking of Moonfleet. If there's one thing that annoys me, it's that EP has either the artist or (if possible) the author signs. I'm happy they include the author's signature when possible, but why not both both author and artist? Still, that's a minor point. Now in terms of LEC quality, of course these books are not letterpress and the paper is not handmade. That said, the quality is still excellent, the paper is NOT thin, and the art is wonderful. In fact, I prefer these illustrations over quite a few of the LEC books I have seen, but that's just my personal opinion. Also, the books are much more affordable in comparison to say Arion Press. Lastly, the slipcases are very high quality. Not that you should purchase a book for the slipcase, but these really are well done. I have been reading your enthusiastic comments about the limited edition of Tarzan for, I think, a year. Finally, I let myself to be persuaded by you and ordered a copy of Tarzan today for myself. 4: I think you'll be very happy with it! When you get it, please let me know your thoughts. I have received the Tarzan, and I agree with astropi - it is a very beautiful edition that is a pleasure to read! I am very impressed with it! 6: It sure is a beauty! An inspired choice for a DLE as well. Although their historical facsimiles can be amazing (think Dore), I actually prefer these signed DLEs with original artwork. Especially when they take a book that's typically overlooked in fine presses, such as Tarzan. Enjoy! 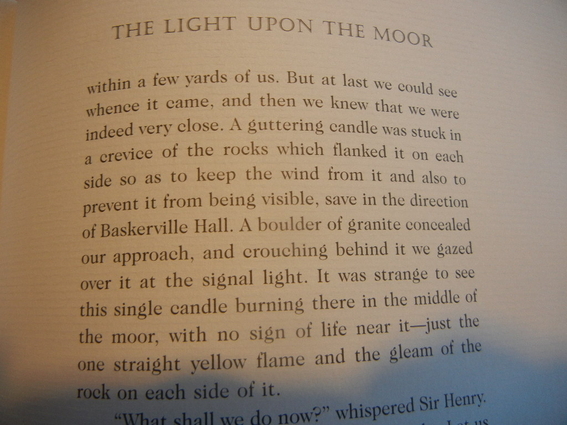 So, has anyone purchased the Hound of the Baskervilles DLE? This is probably the only DLE I am remotely interested in. The illustrations look well done, but I'd really like to know if the printing is up to Folio Society/Heritage Press quality and clarity. Can anyone provide a review? Thanks! Totally agree, I received mine a few days ago. I own most of the EP DLE's and I have to say that this book is definitely in the top 5, and is a real beauty. The quality of paper, illustrations, binding, etc.. just amazing. If time permits, I will try to make some pics this weekend and post on this site. >9 astropi: Yes, I was impressed by that letter as well. That's partly what has made me think twice about buying this book rather than just pass it by. >10 geiles: Thanks for your willingness to tells us more. I am particularly interested in the print quality. Since this is a new edition, I'm assuming EP put the time in to typeset the text rather than just doing a facsimile of some other edition. It may be helpful if you provide an image of the copyright page. Thanks! 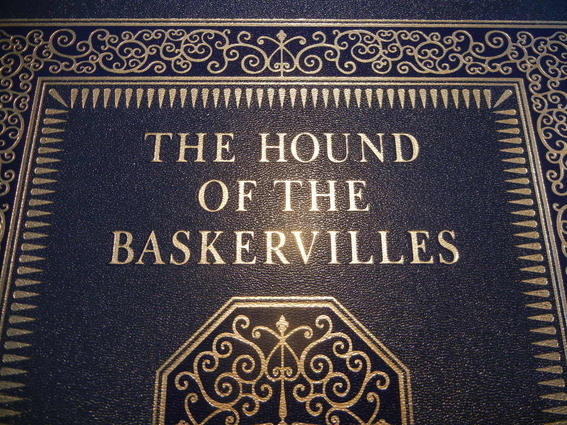 Easton Press has added yet another review of the Hound of the Baskervilles from the Newsletter of the Sherlock Holmes Society of London. The review states that the type is clear on fine quality paper, and they rave about the illustrations. I think that review is enough to put me over the line and order this DLE - my first! If I like this one, I may also get the Tarzan DLE. Well, I ordered and received this DLE. A beautiful book in every respect -- BUT, the type is NOT especially clear; it seems to be a variant of grey that appears kind of faded against the less-than-white paper of the page. 13: share some pics? Thanks. Sorry; that would be quite difficult (long story). Perhaps another purchaser could post pics of the text. But the absence of optimal clarity is indeed noticeable (IMHO). I ordered this DLE as well and will be able to share pics when it arrives. Since I am so skeptical about EP books now, I opted to be billed for the book rather than the credit card installments. If the printing is not up to the standard of Folio Society or Heritage Press books, the "DLE" will be going back since it clearly will not be "Deluxe"! >13 DavidMF: Where are you located and how long did it take the book to arrive? I ordered the book last week. >18 supercell: The Tarzan DLE has been available for a couple of years. I was surprised EP had stock so long when other DLEs sold out faster. If it is gone, I'm not bothered. I'm being very cautious about buying anything from EP these days. 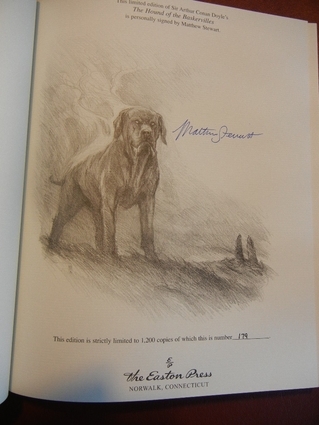 The main thing that interested me about the Tarzan book was that, like the Hound, it was signed by the illustrator, and I don't have that title in another edition. We'll see how the Hound DLE looks. My standard will be FS and HP books. It has to at least be up to that standard. The Hound arrived yesterday, much to my surprise since I ordered it only nine days ago. EP shipped it via FedEx, though I had not requested expedited shipping. Not sure what that was all about. i was not billed for expedited shipping. I will post my impressions on the weekend with pictures. This is a fully leather bound book in a cloth covered slipcase limited to 1200 copies. This is a slipcase covered in blue cloth on the outside and thin gray felt on the inside. The felt inside the case is a nice touch that will certainly protect the book from any light scuffs that could occur moving the book in or out of the slipcase. 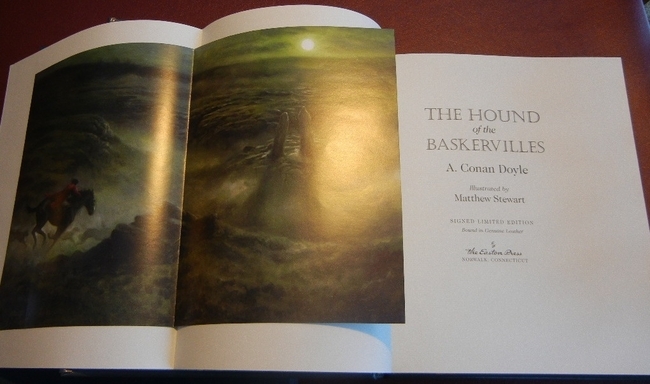 The right side of the slipcase has a high gloss illustration of the gates of Baskerville Hall with a horse drawn carriage going toward the Hall in the distance mounted on it. I would almost say this is the nicest illustration in the whole set. It is surrounded by a wide gold stamped border. The rest of the case is just the plain blue cloth with no additional stamping. The only defect here is some of the gold is flaking in tiny bits, so there are little flecks of gold noticeable on the cloth on the right side and less so on other sides of the slipcase. All in all a very nicely done slipcase. The cover is gray leather with a blue background to much of the gold stamping. There is a blue background to the boarder on the front cover, a blue background to the octagonal design on the cover, and blue background to the gold stamping on the spine. There is even blue “shadow” stamping to the Title lettering on the front cover, giving the letters the illusion of depth. The back cover has no stamping. The leather does appear to be of a different quality than the regular EP books. My regular EP books have noticeable “grain” to the leather, whereas the leather on this book is quite uniform throughout. The cover boards are noticeably thicker than regular production EP books. Inside was a certificate of authenticity signed by the illustrator, a “witness” at EP who’s signature I could not make out, and Jeffrey Kornblum the Publisher at EP. 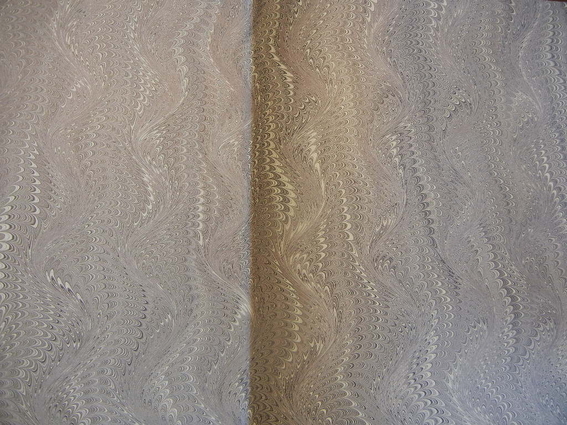 The endpapers are marbled in the same gray/blue theme, though the main background color is tan. 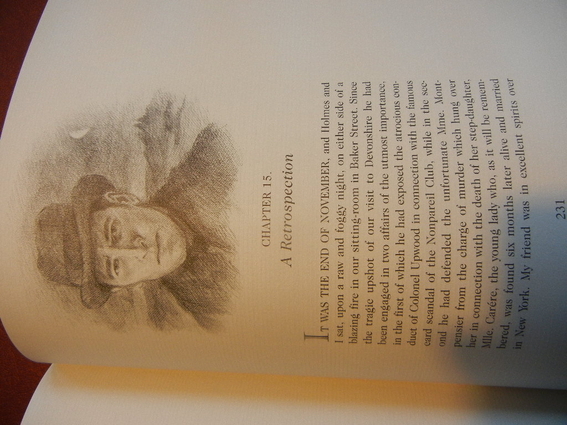 The first printed page is the illustrator signature page, which is well done with a pencil drawing by the illustrator. This is copy #179, which seems like a low number for as long as this has been available and given that it is “limited” to 1200 copies. On the other hand maybe the book copies are sold randomly rather than in sequential order. 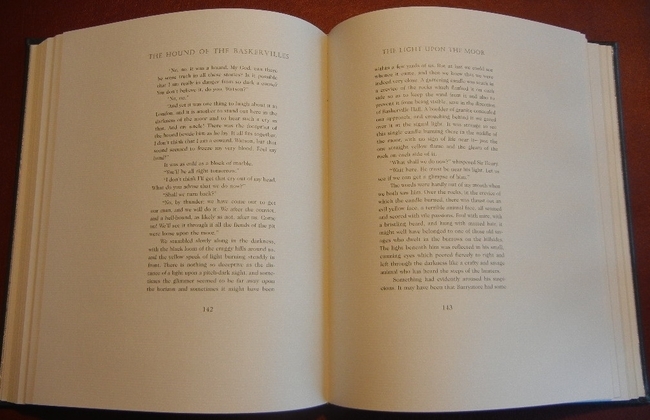 The next page is a title page followed by a foldout color illustration and the publisher’s title page. At first I was confused about the foldout illustration because it did not unfold. Then it became clear the color illustration is glued to the large foldout page at one end, and the larger, blank page is sew into the binding. This is actually the case throughout the book. All of the color illustrations are printed on a glossy paper and glued onto a blank page sewn into the book. The illustrations are only glued at one end of the illustration, the rest hangs loose. The front illustration folds against itself. The other color illustrations are protected by a heavy stock type of “tracing” paper, which I assume will prevent any image transfer from the color illustration to a printed page. I like the protective page, but I’m not sure about the color illustrations just being glued to a blank page in the book. I’m not clear why EP would use this method for the color illustrations. This is not how quality books from other publishers I am familiar with do illustrations such as Folio Society, Heritage Press, or LEC. Next is the copyright page and Table of Contents before the text of the book begins. There is no introduction or publisher’s notes. In my opinion, the text is clear and sharp, and I think the ink is black. However, the pages are neither white nor cream, but a light shade of gray. I think this gives the impression that the text is not a true black. It certainly leads to less contrast between type and the page than either white or cream does. The paper is of a high quality, heavy stock, but I really don’t understand why EP chose light gray for the page color. However, this is not the most striking aspect of the printed pages, but rather how the text is laid out on the page. The text block is not centered on the page either horizontally or vertically. The text is offset toward the binding and top of the pages. The pages are roughly 8.5” wide by 11” tall or 93.5 square inches. However the text is confined to 4” wide by 7” tall or 28 square inches (or taking up only 30% of the space on the page.) The bottom border is 2.5” below the page number, and outer boarder is 3” from the text to the outer edge of the page. I found this asymmetric printing on the page uncomfortable, and the very large asymmetric boarders strange. It made me wonder if the copy I received had been misprinted. The beginning of each chapter is accented by a pencil illustration. These are actually very well done and reproduced in the book. In fact, I’d say they are the highpoint to the book design. The only thing that detracts from their quality is that, like the text, they are printed very high on the page, in some cases leaving an upper board of as little as 0.25 inch. Again, this is a bit jarring when the bottom border is 2.5 inches. I wanted to like this book, but I ended up being disappointed. This book had a lot of promise and the design could have been great with a few easy fixes: centered text that took up more of the surface area of the page, illustrations printed on pages sewn into the binding, white or cream colored paper. In fact, these are such obvious fixes that it makes me wonder if EP has anyone who understands basic book design? Finally, the last problem was an actual defect in the book. Five or six pages (including an illustration and protector sheet) clearly had a crease in the page. I can’t figure out how those got there, but they were clear and noticeable, and I don’t think they would press flat over time. My standard of comparison is regular production Folio Society or Heritage Press books, and unfortunately this EP DLE does not come up to that standard. Another valid question is value. Is this book worth $267 when I compare other books I could get for that price (4 or 5 FS books, 4 or 5 LECs, 4 or 5 regular run EP books, 10 to 15 HP books)? I have to answer no, but others may place a different value on what EP offers compared to publishers of fine books. Thank you for the review; I am really disappointed by the text position. It just look odd. I was really considering this publication but now I have decided against. "I’m not sure about the color illustrations just being glued to a blank page in the book. I’m not clear why EP would use this method for the color illustrations. This is not how quality books from other publishers I am familiar with do illustrations such as Folio Society, Heritage Press, or LEC." Thanks for the review! Tipped-in illustrations has been done for hundreds of years, and it is considered one of the higher-quality ways of displaying illustrations. The FS does indeed do this for many of their Limited Editions. Heritage Press did this as well for some of their publications. 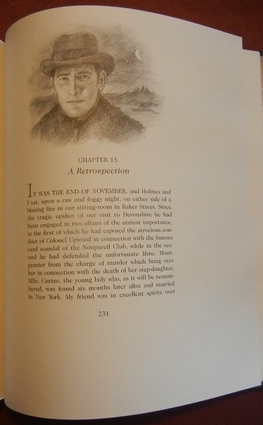 Tarzan and A Christmas Carol both use tipped-in illustrations as well. I really like the marbled endpages for Hound. For the record, Tarzan's and A Christmas Carol's endpages are illustrated. >22 eastonlionel: Nice review. As a side note, I've got a signed, limited edition of Undine illustrated by Rackham and published in 1909 that uses tipped in color illustrations. Thanks for the comments on the use of tipped in illustrations. It was not a big deal, I just had not seen this in other books. The blank pages in Hound that the color illustrations are glued to are actually a different type of paper than the printed pages, so I thought, if you are going to sew in different paper for the illustrations, why not print the illustrations on that paper. I guess I'd be a little wary about the glue deteriorating over time, or an illustration accidentally getting creased or torn since it is not attached to the page on all sides. I have seen generous borders in LEC books, but not this generous. As I mentioned after looking at pager after page, you get the feeling the pages have been misprinted. This is especially pronounced on the chapter pages with illustrations. >27 eastonlionel: The blank pages use for the tipped in illustrations in my Undine were also of a different type paper. In this case much thicker and darker. When full color artwork requires some kind of photographic reproduction, fine presses generally use tipped-in illustrations so that the paper to which the illustration is glued is the same, or nearly the same, as the paper used for the printed text. Most aficionados of fine book design would consider a coated paper stock page bound in with text pages undesirable. eastonlionel, your question "is this book worth $267 when I compare other books I could get for that price (4 or 5 FS books, 4 or 5 LECs, 4 or 5 regular run EP books, 10 to 15 HP books)?" is a bit misleading; you're comparing, in the case of HP and LEC books, used books being sold by collectors or used book merchants with a newly published book being sold by the publisher. Even new FS LE books with an artist's signature, which are made to similar standards to the EP Hound are more expensive. Their new unsigned, non-limited books have been averaging $80 these days. 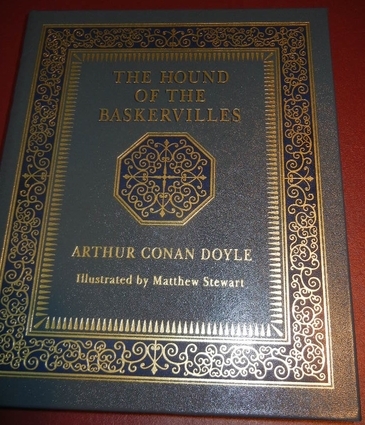 Perhaps a better question to ask for evaluating this book is: how does it compare to the recent Arion Press edition of The Hound of the Baskervilles, a limited edition of 400, illustrated with B&W photographs? I certainly like the atmospheric photographs, and I believe I would prefer the typographic layout of the AP edition (the excellence of the press in this regard has never been in question), but the book is printed by offset lithography and the paper is probably not rag, so on those terms it is directly comparable to the Easton book. It boils down to: do you prefer originally commissioned full-color illustrations (with an artist's signature), off-white paper and leather binding to photographs (without the photographer's signature?) in a clothbound edition with idiosyncratic typographic layout and white paper? This seems a personal preference issue, and not so much a one of dollar value. >29 Django6924: I tend to shy away from the $80+ FS books unless it were something I was really interested in. My FS purchases are in the less than $60 range. You are certainly right that the FS limited editions are quite a bit more expensive than the cheapest EP DLE, and I have not purchased any of those. I understand that buying new vs. used can be apples to oranges. However, I don't really see a difference between a used book in Fine or near Fine condition and a new book. And, what is the difference between a new book that has a defect (as my copy of the Hound does) and a used book? This is the last EP book for me. I called EP yesterday to return the Hound. Fortunately, they are sending a return label, so I'm not out any money. I will say, they are VERY GOOD at returns. In the end, why did you elect to return Hound? Was it your assessment that the quality didn't justify the price or was it due to the specific typesetting (large margins) that you raised objection to? >31 UK_History_Fan: I'd say it was the overall cost for the total quality of the book. I would rather have 3, 4, or 5 well done books from FS (or LEC in VG or better condition) at that price than one book from EP that is not well designed. However, I'd say the single biggest factor was the how the pages were laid out. Every time I looked at the pages, they looked mis-printed. Yes I do remember that argument for/against tipped-in illustrations. I think I was at that point new to book collecting and knew very little. Although I don't have anything against tipped-in illustrations - actually I prefer them when done properly - I was against the minimal thin strip of glue used that would eventually when handling the pages fall off. Oh by the way, supercell, get your books catalogued, we love to see book collections. It is as if I am entering your virtual bookshelf to see what kind of person and what interests you have. >33 supercell: Thanks for those links, they were an interesting read. After reading about the page layouts I took another look at the Hound DLE, and went through the whole book page by page. After reading about the layout of margins and the various styles, the wide margins don't bother me as much, now that I have a better understanding of book page layout. However, it should be noted that the Hound does break the margins rule (even for "Deluxe" layout) found at your first link. It says the inside margin should be the smallest followed by the top margin, whereas in the Hound DLE, the top margin is the smallest. Aslo, the site states that the outer border should be the second largest and the bottom border the largest. However in Hound the outer border is the largest (3 inches) and the bottom border is second largest (2.5 inches). So this EP DLE does not conform to the general margin rules you mentioned, which I think is what makes it seem like the pages are mis-printed. The text is too high and to the center of the page. I had mentioned in my review that several pages in a row had a crease in them. After going through the book page by page, I found more pages that had defects randomly in the book. About three pages had what looked like a pen had made an impression in the page in the outer margin, and several more pages had small creases. Again, these were randomly found in the book and all about an inch or so from the page edge. I really can't imagine what caused these, sloppy production? Also, I noticed glue that had oozed out at several points between the endpapers and the leather cover. All of these small items give the impression of sloppy workmanship. I can't say I've found these defects in any of the 150+ EP books I purchased in the 1990s and early 2000s. Re-examining the book just confirmed that I'm returning it. "The book's interior has been designed in accordance with the "secret canon" of book design--a systematic method (in use since the middle ages) of constructing a page with aesthetically pleasing proportions. Because the canon results in margins that collectively comprise over half the area of each page*, it is considered a waste of valuable space by many modern publishers and is often abandoned in favor of more economical alternatives. Today, when a book follows the canon, it feels either dated (to some readers) or classic (to the rest of us)." "*The secret canon--also known as the "golden canon" or the "Van de Graaf canon"--results in four unequal margins that are 1/9 of the page width (inner margin), 2/9 of the page width (outer margin), 1/9 of the page height (upper margin) and 2/9 of the page height (lower margin). If you do the math, you'll discover that the margins take up 5/9 or 55.56% of the total real estate. To save space, modern editions will often allow content to cover a greater overall percentage of each page (although the ratios between the four margins may remain unchanged)." I should add that, in book design, generous margins have long been considered a mark of luxury (as opposed to, say, the penny-pinching paper-preserving practices employed by publishers in the production of paperbacks -- ppthh!!). >36 SilentInAWay:: "...penny-pinching paper-preserving practices..." -nice alliteration, Silent! Ideal? The web page that you mentioned as a source doesn't say this. It says that a "luxury book...might use as little as 25% of the area for type". The proportions adopted in the example given further down that page are intended to make a simple point: that "deluxe" margins can be considerably larger than "classic" margins. It does not say anything about these proportions being a deluxe ideal. I suspect that its intentions are polemic, its goal being to emphasize the difference between "deluxe" margins and what it calls "standard" and "classic" margins. The web page further emphasizes this difference by misrepresenting "classic" margins as taking up 50% of the page size. The text block constructed following the most common "classic" canon of book construction takes up 44.44% (the margins being 55.55%). This percentage obtains for several of these canons (the differences between some of them lying only in the ratio between page width and height). The difference between 44.44% and 50% may seem trivial, but it was a significant difference for those who truly sought an "ideal" book layout. Now, this 44.44% represents the classic aesthetic "ideal"...as it was produced by the layout that was traditionally thought most pleasing to the eye. This ratio is achieved by using margins that are 1/9 (inner) and 2/9 (outer) of the page width and 1/9 (top) and 2/9 (bottom) of the page height. If the ratio between the width and height of the book is 2:3,* then these margins would create a text block whose height is equal to the width of the page. - The Wikipedia article on "Canons of Page Construction"
- A short YouTube video showing how canonical margins can be constructed using only a straitedge. Now, all this does not discredit what I take to be the main point of the web page that you cite--that deluxe books often feature decadent margins ("decadent", of course, being my word -- I would consider margins to be "decadent" if they exceed, say, 50% of the page size). I also agree with you that the proportions mentioned for the Easton Press books discussed above (in particular, where the outer margins exceed the bottom margins in a book whose height exceeds its width) are unequivocally non-standard. For some, however, the idea of luxury is synonymous not with the idea of beauty, but rather with the idea of waste (as in "see how much I can afford to spend on something unnecessary"). When luxurious waste becomes the guiding principle of book design, all canons--traditional and contemporary--are thrown out the window (aesthetics be damned!!). *Some have believed that the appearance is even more beautiful when the ratio between page width and height is based on the golden ratio of 1:1.618, rather than the 1:1.5 (2:3) of standard "classical" page construction. The Hound's time is coming to an end. But wait, you can help him become immortal. Just buy one of the last 100 copies in order to preserve his life. Won't you help?
? Why does this post read like an advertisement? Just having some fun and reviving a very old thread. >41 Wootle: Yes, exactly! The Hound will be kept safe in his slipcase and live on forever! >44 NotDownInAnyMap: Its not a slipcase its a dog house. Or perhaps a dog habitat.